I call this jugaad. Because this is all about frugal weddings, and just because everyone nowadays is going for this ladder prop…why should you be left behind. All those pinterest worthy ladder props you see all over the internet…when you look at it, doesn’t your heart go…aaww if only I could have one for my wedding. Well you totally can ! I’ve been seeing the ladder prop for quite some time now, but it never really hit me…how to go about things. It just so happened that I was sitting in the hall of my house, watching TV…when these lizards just barged in from my balcony window. I immediately looked at the ceiling and I noticed my fan blades turning black from dust. The lizards were driven out eventually by yours truly in a major fight which involved the broomstick etc…but the point being…I realized that I needed a ladder. Not just to clean the fan, but in general…in the house. Now, you may say that not everyone has a ladder in the house. True, I don’t have one either…and nor am I looking to buy a big bulky one in the near future. Its just too much effort. But but but, someone among your neighbors might have one. If you’re not too close or comfortable, your decorator definitely will have one for sure. Just don’t tell him, what it is you need it for….just ask him to get you one. If you can get it from someone in the building or from the building itself…nothing like it…but just put some effort to get one. It can be any ladder, old rustic broken kinds…or a fantastic aluminium one…anything will do. If you’re having an evening function, then this probably is my favorite look. Candles are so romantic, and just add a bit of fresh flowers or junglee flowers…it really doesn’t matter…and what you’ll get is a gorgeous wedding prop. It could be anything from your family photos, to photos of the couple…your pre-wedding photoshoot pics…or any fun pics that you wish to share with your guests. Its super easy, and all you have to do is give the frames to the decorator, and he can pretty much place it on his own. Just share a few pictures so he gets an idea of how you want the ladder prop to look…and you are good to go. If you don’t want to do frames, then simply add the pictures to a string, and clip it using any clipper you find at the stationary store. You can pretty much just cut a piece of cardboard paint in black and write in handwritten style your message. No need to buy super fancy stationary or get a professional print out done. The idea is personalized so its going to be adorable. Give them a nice personal touch by tying a sash around it…which matches the theme of your wedding…or simply tie a knot. Just be creative with what might look good on the ladder. Nowadays flower vases are not all that expensive. You can get the cheaper ones too from any supermarket store like hypercity, dmart, more etc. They all have it….and since Diwali is soon approaching, the market is going to be swarming with these funky shaped vases. Collect some and keep for your upcoming wedding. But in case you miss out for some reason, you can also find these at Crawford Market, or Sarojini (if you’re in Delhi). They come for as cheap as 60-100 bucks a piece. #8 Crystals + flowers + light = wowww ! Crystals shine, so light really plays a role here. 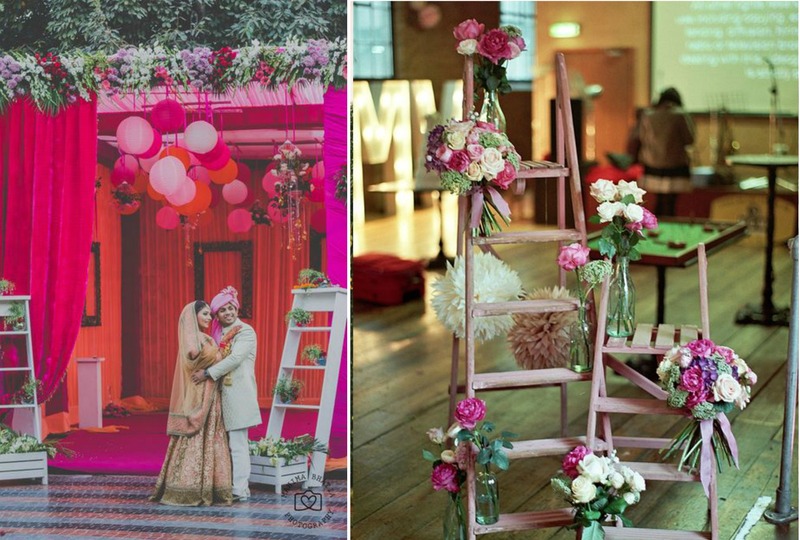 To that add a few flower vases and a string of rajnigandha from the decorator…and you will have one stunning ladder prop to show off to all your guests. I couldn’t find a picture online…but think about it…if it can be done…it will really be nice. #9 Place wooden planks on the ladder steps and add some cupcakes ! If you want more wedding prop ideas, check out these posts I have written which can help you turn your frugal wedding totally fabulous !